Students from Guiding Hand School learn about fire safety from volunteers of the Gallipolis Fire Department. Firefighter Walter Arthur demonstrates what full bunker gear looks like, and teaches children to not be afraid. GALLIPOLIS — Students in local schools are learning about fire safety for National Fire Prevention Week. 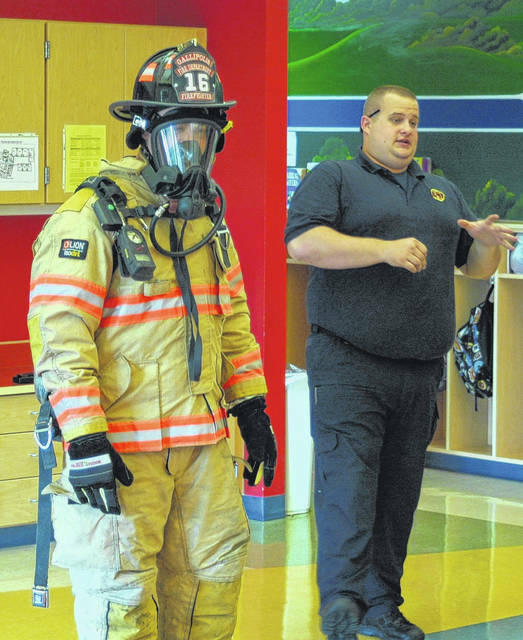 Members of the Gallipolis Fire Department will travel to various schools in their coverage area educating young children on fire safety and what to do if there is a fire in the home. “You need to have a special spot to go to in case of a fire,” said Firefighter Josh Staley to students at Guiding Hand School Tuesday morning. Having a plan in case of an emergency can save a life, according to Staley. Students were instructed to have a special place outside the home to go in case of a fire; the neighbors house, a flag pole, the mail box, anywhere that is a safe distance from the fire and responding fireman can see and account for anyone that was in the home. Unfortunately children going back into houses for pets has happened enough that it was addressed to the students, emphasizing it to the students. Teaching the kids about what to expect when they call 911 as well as what to expect if they see a firefighter in action was all part of the morning’s lesson. Walter Arthur, volunteer with Gallipolis FD dressed in his full bunker gear with an airpack to demonstrate what a fireman looks like when they are working a fire. With full gear on, Arthur’s voice was modulated and the mask covered his face resulting in an image that could be scary for young children in a fire situation. Demonstrating what they look like and reminding kids that fireman are there to help could save a life. 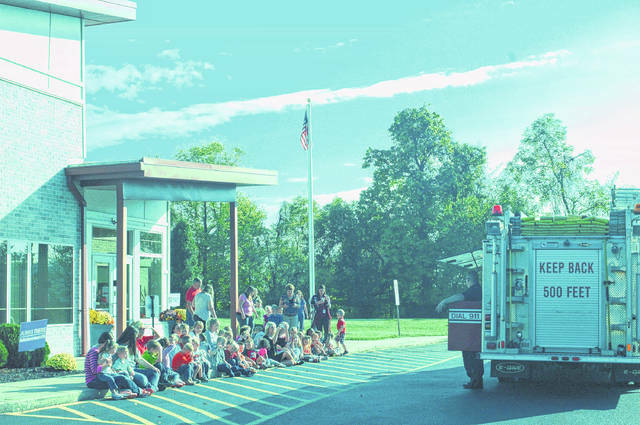 Gallipolis Fire Department will be sending volunteers and equipment to various schools in the area throughout this week and next to demonstrate fire safety and educate students about fire prevention and what to do in case of an emergency.